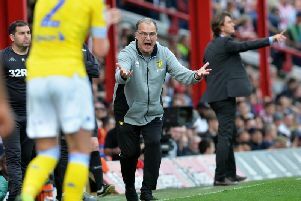 A red card for first-choice goalkeeper Marco Silvestri in Saturday’s defeat at Rotherham United has opened a door for one of Leeds United’s most highly-regarded youngsters. Phil Hay reports. They say in football that when one door closes, another often opens. It worked out that way for Bailey Peacock-Farrell in 2013 when Middlesbrough released him from their academy. His exit from Boro was less about talent than it was about basic capacity. Boro had other goalkeepers, including an England youth international, on their books and chose not to offer Peacock-Farrell a scholarship. As happens in the congested world of junior recruitment, Leeds United picked him up and took him on. Last June he received his first professional contract. Tonight, another opportunity presents itself in circumstances which Peacock-Farrell might not have expected. Leeds United’s head coach, Steve Evans, talked about blooding him with a full debut before the end of the season but it was never clear when the opportune moment would come, particularly in light of the club’s inconsistent results. A red card shown to Marco Silvestri on Saturday, however, will give Peacock-Farrell his chance against Queens Park Rangers. The advantage for Peacock-Farrell this evening is that he is not being plucked from thin air or thrown into the team on a whim. A broken ankle suffered by Ross Turnbull in October and the departure from Leeds of USA Under-23 international Charlie Horton gave the 19-year-old a seat on the bench for the first time when United lost 1-0 at QPR in November. Aside from last month’s win at Blackburn Rovers, when Peacock-Farrell was ill and Eric Grimes deputised for Silvestri, he has been there ever since. Evans was talking up Peacock-Farrell long before the dismissal of Silvestri made the teenager’s debut inevitable. Shortly before Christmas he tipped the Darlington-born youngster for a high-profile future, saying: “I don’t say it often but this boy will play in the Premier League.” Peacock-Farrell’s contract is up in the summer and several Premier League teams have been linked with him. Leeds are expected to offer him a new deal. Silvestri trained alongside Peacock-Farrell at Thorp Arch yesterday but will sit in the stands tonight. With the experienced Turnbull still absent through injury, Grimes – a Republic of Ireland Under 21 international – is to be named among the substitutes. Evans said recently that Peacock-Farrell’s talent and progress justified the club’s decision not to recruit more proven cover for Silvestri. He stands by that view. “If there was any doubt about Bailey then we’d have brought someone else in,” Evans said. “It was always possible that something might happen to Marco. “The nice thing is that the other players think very highly of him. If you bring someone into a club, say on trial or for money, and the players don’t think they’re at the right level, it becomes pretty obvious. It’s no different with youngsters but that’s never been the case with Bailey. I’ve heard good things about him going back to when I first came here. INJURED: Ross Turnbull, right, with goalkeeper coach Neil Sullivan. Picture: Tony Johnson. “It’s his first-team debut so I want him to enjoy it. You only get one senior debut in your career and you remember it forever – the date, the opposition, the scoreline, how you’ve played. I’ll be the same as I was when I threw in Lewie Coyle in January – nervous for him, rather than about him. But he’s known since Saturday that he’s playing and he’s had a few days to get ready. Leeds were always prone to the possibility of an injury to Silvestri or a red card like Saturday’s. The 25-year-old incurred a one-match suspension after conceding the 89th-minute penalty which Rotherham converted to seal a 2-1 win. Blame for that incident was carried largely by Giuseppe Bellusci, whose rash attempt to clear a cross with an overhead kick forced Silvestri to dive at the ankles of Lee Frecklington. Evans had no complaint about the decision to award a penalty or dismiss Silvestri and will look for his defence to give Peacock-Farrell more disciplined protection against QPR tonight. Evans said: “It was a cardinal sin on Saturday, a bad mistake, and I said that after the game. Giuseppe held his hands up..
“As a head coach in these situations you almost can’t win. If Bailey plays well everyone will say he was good enough anyway. If he has a tough night, everyone will say my judgement was poor and I should have signed some cover. But my judgement is that this kid’s good enough to play and as a team we need to get it right in front of him. Peacock-Farrell is the latest in a long line of first-team players produced by United’s academy but one of relatively few keepers to make the step from the youth-team ranks to a full debut. Paul Robinson and Scott Carson were celebrated graduates of the development programme at Thorp Arch and Alex Cairns made a single appearance as substitute on the night in 2011 when Paul Rachubka’s implosion against Blackpool forced Simon Grayson to replace him at half-time. Silvestri will return to contention for Saturday’s game at Championship leaders Burnley, a very different type of fixture to tonight’s mid-table match. He has started all but one fixture this season but Evans said: “I’d love it if Bailey gave me a difficult decision for the Burnley game. If he gives me a difficult decision then I’ll be ready.